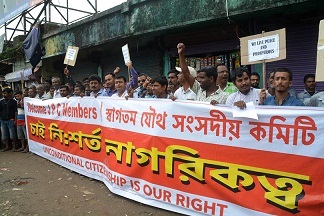 Hailing the controversial Citizenship (Amendment) Bill, 2016, a citizens’ group of Barak Valley on Friday appealed to the Centre to pass the Bill by the Parliament at the earliest. “We support the Bill. This Bill doesn’t talk about Bengali Hindus only, it talks about people from other religion also,” Sushangshu Sekhar Bhattcharya said in a press conference in New Delhi. A 30-member delegation of the citizens’ group from Barak Valley met BJP general secretary Ram Madhav, Union Minister VK Singh, Home Minister Rajnath Singh, senior leader Subramanyam Swamy during their stay in New Delhi in last few days. “We have submitted our memorandum supporting the Bill. We have appealed to the central leaders to take steps to pass the Bill at the earliest,” Vivek Poddar, another member from the citizen group said. The group also met National Human Rights Commission (NHRC) representative in New Delhi regarding the human rights violation of the people in detention camp. “We have raised some serious human right violation in the detention camp,” the citizens’ group members said. Meanwhile, the final draft of the much awaited updated National Register of Citizen (NRC) is unlikely to be published on June 30 as the NRC coordinator Prateek Hajela has moved to the Supreme Court Prateek Hajela, seeking a deadline extension. Hajela cited heavy rainfall and subsequent flood in Assam as the major reason to postpone the draft NRC publications. The apex court will hear the matter on July 2 and next date of the release will be declared by the court on the same day.